Happy Friday, and welcome to a brand new chapter of Albert the Alien! 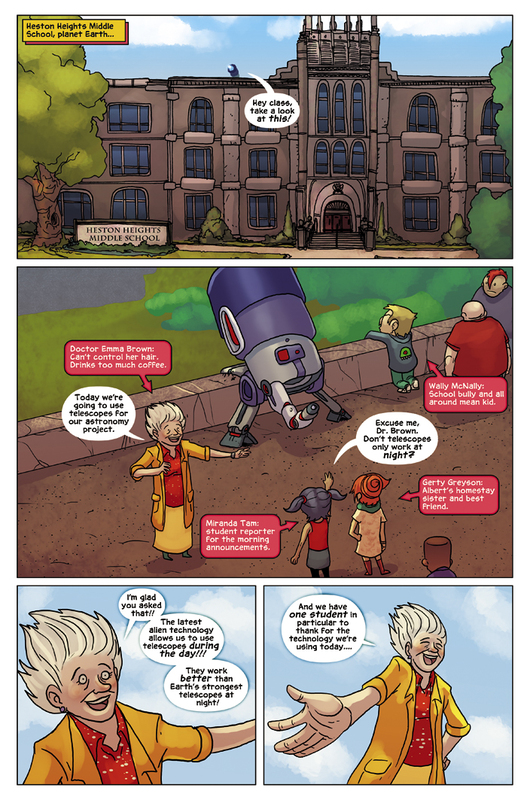 This adventure opens on the roof of the school (hey, we’ve been there before), and introduces a new teacher: Dr. Emma Brown. I don’t think I need to tell you where she’s a parody from (cough cough “Back to the Future” cough cough). But honestly, Gabe and I have been providing opportunities for real people – like you, or people you know – to appear in this very comic, and this teacher role was one such opportunity. No one snatched it up in time, so we moved forward with a fictional character. We offer roles for teachers, parents, and students in this comic all the time on our facebook page. And if you’re an adult but want to appear as a student, Gabe can easily design you to appear as a younger version of yourself. We still have some opportunities in this very issue. We have 4 scientists appearing later in the story, and we can design them to look like you.